In Small Things Remembered » President Mohammed Daoud and the Jimmy Carter White House. 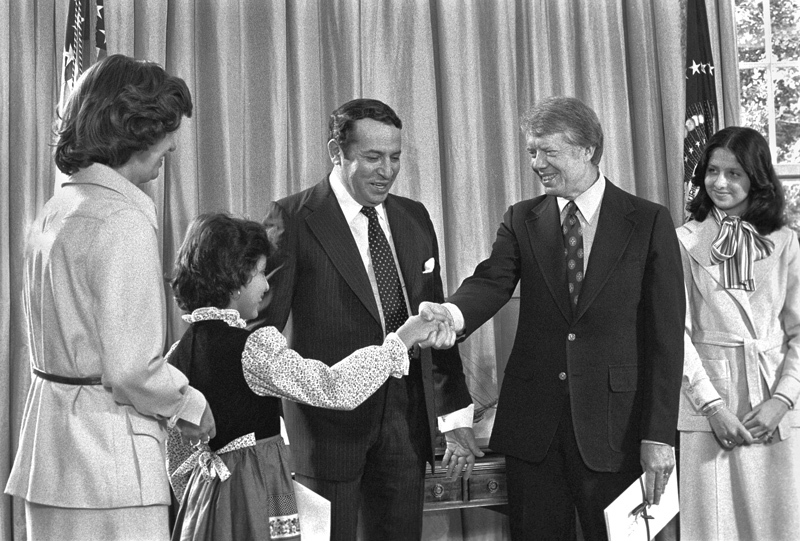 President Mohammed Daoud and the Jimmy Carter White House. a. President Carter receives credentials from Afghan Ambassador Abdul Wahid Karim. b. Letter from President Daoud to President Carter (English). 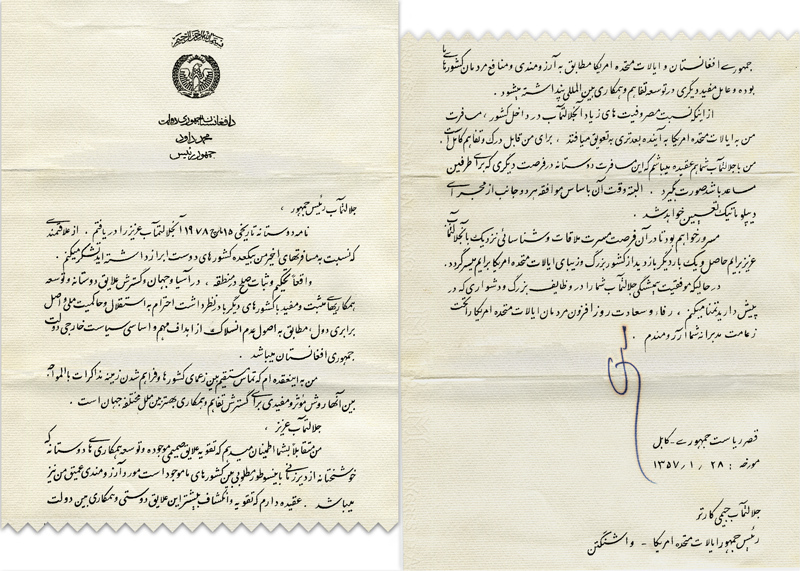 c. Letter from Daoud to Carter (Dari). President Daoud sent emissaries to Washington, D.C., to maintain long-standing diplomatic relations. Before Karim’s arrival, Abdullah Malikyar, the former President of the Helmand Valley Authority, had served as Afghan Ambassador to the United States since 1967. 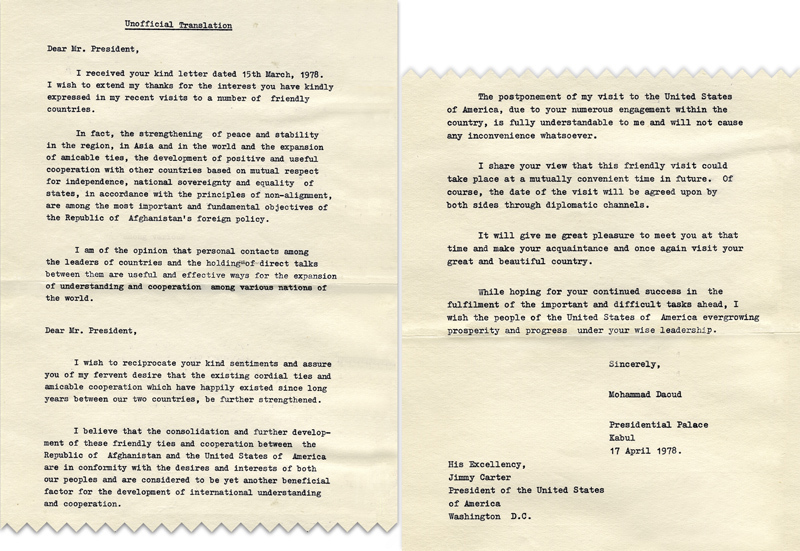 In the spring of 1978, Carter and Daoud exchanged letters and discussed the possibility of the Afghan President visiting America. Courtesy of the Jimmy Carter Presidential Library. nlc02255.11a. Documents courtesy of the Embassy of the Islamic Republic of Afghanistan, Washington, D.C.